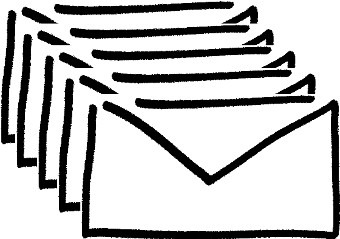 Email marketing was predicted to go the way of dinosaurs and typewriters quite some time ago. As marketers, we were clear that this form of (some would argue) direct marketing would not survive other more recent approaches such as blogging, social media and online landing pages. Yet, as the data have repeatedly shown, we were completely wrong - email marketing is alive and well. One other prevailing argument is that although email marketing may not be dead, it surely isn't a bona fide 'Inbound' Marketing approach. Indeed email marketing might be appropriately classified as an 'Outbound' methodology under certain circumstances such as when marketers purchase email lists from non-credible sources and cold-blast everyone on it. Dan Zarella's The 2012 Sate of Inbound Marketing, page 15 leaves email marketing in limbo by depicting it as 'not classified' in either Inbound or Outbound categories, along with the likes of PPC. I'm not on-board with that characterization because most responsible marketers won't send marketing emails unless a subscriber has first opted in. Opting in happens when a subscriber's interest in your products or services have been piqued to the extent that they want to hear more, so they ask for it. This progression aligns as a decidedly Inbound Marketing flow. Naturally, responsible marketers also follow CAN-SPAM laws by offering a way for their recipients to 'opt-out' as well. The strength behind email marketing is, if anything, increasing rather than going away. But developing a well targeted email segmented by customer persona can be a real challenge. Hitting the sweet spot that keeps them engaged and opted in is truly a work of art that takes time and practice to achieve. Next, take a look at our free ebook that leads you through the steps to creating 5-star marketing emails, it's yours to download now and you might pick up some useful information.